Fatima, Harissa, Damascus, Samalut, Assiut, Zeitun and many other places where the Virgin appeared are the destination of incessant pilgrimages from Lebanon, Syria, Egypt, Iran. Pilgrims in search of physical but also spiritual healing; spontaneous and mystical prayer and not the schematic and formal verses of official Islam. The iconoclast Salafists destroy places of pilgrimage every year. But the devotion to Mary is growing, also fueled by the stories of the Koran. The spiritual dialogue between Christians and Muslims is much more promising than cultural, theological or political dialogue. 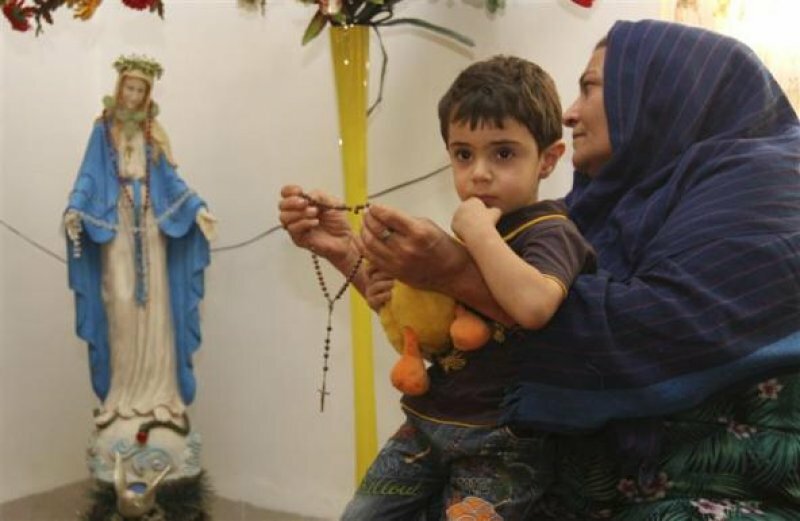 Beirut (AsiaNews) - Each year millions of Muslims come on pilgrimage to the Catholic Marian shrines. Not only to the major shrines such as Fatima in Portugal or Harissa in Lebanon, but also to Egypt, Syria, Iran. Muslims - especially Muslim women - go to give thanks to the Madonna or great Christian saints, like St. Charbel or St. George. In the eyes of many Westerners these gestures seem ridiculous or false: they speak of apparitions, of prayers, but then there are massacres, killings, violence in the name of religion! Like it or not, the religious phenomenon is alive in Latin America, in Africa, in Asia. When you see millions of Hindus go to bathe in the dirty water of the sacred river it may seem like a ridiculous thing. Yet for those who do it is an act of purification, of prayer. The West is tolerant and benevolent towards other religions, but its attitude towards Christians is increasingly hypercritical. The West is not post-Hindu, post-Islam. It is only post-Christian! The point is that in the West, the supernatural is considered outdated, it is branded as mythology, illusion, instead the West is forever denouncing the difficulties that neither miracles nor pilgrimages can erase. But in the rest of the world the spiritual dimension is alive and well. In the East, the religious sentiment is very much alive among Muslims, Christians and other religions. But in most of the West - especially on the part of intellectuals - the religious sentiment is seen as a thing of the past, irrational, naive. We must state this clearly: this interpretation is wrong. In Egypt, there are at least a dozen places of pilgrimage dedicated to the Virgin, which commemorate the journey of the Holy Family in Egypt. The tradition is very rich in the apocryphal texts of the fourth and fifth centuries. You can read some passages in the article by then Msgr. Ravasi (now Cardinal) of 28 December 2007, the feast of the Holy Innocents, published in the L'Osservatore Romano. Every year in August, the Feast of the Dormition (Assumption of Mary) at least one million pilgrims go on pilgrimages to various shrines of Our Lady. The most famous are in Upper Egypt (in the South), at Jabal al-Tair, near Samalut, about 200 kilometers from Cairo. The festival lasts for 15 days, people pray, baptize infants (the parish priest has also built a species of baptistery, for Muslims, given the demand for baptisms from them as well) and celebrate. More to the south, about 380 km from Cairo and 7 km from Assiut, there is another similar place of pilgrimage at Deir Dronka where tradition holds that the Holy Family stayed and the Virgin rested in a cave. On 22 January 1980 the Virgin appeared to a deacon. On 10 January 1988 he appeared in the church tower to an Australian tourist, and Jesus appeared with a dove to the workers of the monastery. On 7 August 1990, the Virgin appeared to the monks, surrounded by light, in a cave of the convent. The annual pilgrimage is made during the "fasting of the Virgin" (7 to 21 August, the feast of the Dormition being the 22 in the Coptic rite). More than half a million pilgrims come, among them tens of thousands of Muslims. One of the monks is "specialized", so to speak, in baptisms, because he manages to make the 36 liturgical signs of the cross on the child's body in a minute (he showed me how some years ago!). Even there, Muslims constitute a large number of participants, it is said that they are at least a quarter of the total number of pilgrims. In Egypt, another pilgrimage to modern places of Marian apparitions is in Zeitun, near Cairo. The apparition, which began in 1968, lasted for several months. Various sociologists - not Egyptians - have called the phenomenon a kind of affective compensation, psychical consolation for the harshness of life. But people went there, Muslims and Christians, because they saw a white shape on the dome of the Church of Zeitun, which they interpreted as being Sittina Mariam, Our Lady Mary. The fact is difficult to explain, but was seen by thousands of people and there are also pictures. Another apparition of the Virgin is celebrated in Imbaba, a populous neighborhood. From 1982 to today, reports of Our Lady's apparitions in the Damascus neighborhood of Soufanieh continue. Oil flows from the icon of the Madonna, and the hands of a normal, well-balanced girl of 18, Myrna Nazzour, also sweat oil. The parish priest of the time, quite against it at first, has become the icons' greatest enthusiasts. There too, Muslims and Christians flock in great numbers. Near Damascus there is also a sanctuary to visit the mausoleum of Settena Zainab, the daughter of Ali and Fatima, the founder of Shiism. This is a pilgrimage to the roots. But when you go to places of apparition of the Virgin, the reasons are far deeper. For years now plane loads of Muslim women from Iran have been landing at Fatima, Portugal. They come to pray before Our Lady who appeared to three shepherd children. The reason is that the Madonna was named after the daughter of Muhammad and wife of Ali Ibn Abi Talib. Last year, during the month of May, as I waited for evening Mass to begin in Harissa, I saw hundreds of Muslim families - probably Shiite - who stopped to listen to the hymns before Mass and who only left at the end. The Muslims make their way to these shrines, knowing that Mary is the woman most praised in the Koran, the only woman mentioned by name, called "Siddīqah" (true, believer, holy), a title reserved for men (siddīq). She is the only one whom the Koran states that God has "chosen" (inna Allāh istafāqī), and twice, and that God has preferred her to all the women of the earth (wa-faddalaki 'ala nisā' al-'ālamīn); moreover that she was consecrated (innī nadhartu mā fī batnī muharraran) in her mother's womb before birth. Indeed, a scared saying (attributed to Muhammad and thus regarded as a certainty) says that every child, when born, is "touched" by Satan, with the exception of Mary and her son; a saying that draws very close indeed to the concept of the Immaculate Conception. In the Koran Mary is "the most pure", because God has made her pure. In the Annunciation, in two different chapters, Mary says to the angel,: "How can I have a baby, when no human being has ever touched me?". Thus, in the Koran, Jesus is called: "The Christ Jesus, son of Mary" (al-Masīh 'Īsā Ibn Mariam): never in Arabic is a person referred to as "son of ... (a woman)", but always. .. a man, and therefore Jesus being born of a woman who has not known a man, could not be called "son of Joseph"! Therefore, the last verse (12) of Chapter 66 (al-Tahrīm) of the Koran, reads: "And Mary the daughter of Imran, who guarded her chastity; and We breathed into (her body) of Our spirit; and she testified to the truth of the words of her Lord and of His Revelations, and was one of the devout. " When Mary is referred to in Islam, "'Alayhā l-salām" (peace be upon her) is added, a title that is not given to any saint. This title is also given by Christians to Mary. There is an entire body of literature on Mary in the Koran, written by both Muslims and Christians. What drives Muslims to undertake these pilgrimages? First of all people are looking to rediscover their faith in the essential; they are looking for a renewal of faith. This is also followed by a desire for physical healing. But the question of a spiritual healing is much stronger. This is very similar to the sense of Christian pilgrimages. This trend in radical Islam is somewhat similar to early Protestantism: they despise popular piety as overly naive and distorted. In reality, the people seek God through everyday things, but also through certain phenomena or testimonies overtime. It does not matter that they are Christians or Muslims. There are regular visits to St. George in Egypt, to the shrine of St. Charbel Makhlouf in Lebanon, to the house of the Virgin Mary in Ephesus, visited every day by Muslims, usually women. Sometimes these pilgrimages are made to ask for the grace to have a child at other times to ask for physical healing. And it is always the Muslims to go to the Christians. Another spiritual element present in the faith of the people is fear of the devil. An episode that I experienced many years ago when I was a religious, but not yet a priest, is a very significant example of this. I was at the American University in Cairo and had entered and exited the building several times during the day for some research. At a certain point the doorman stopped me and gently asked me a favor. "My sixteen year old daughter - he says - is possessed by a demon." It was the first time I heard this expression in my entire life. He told me of how this demon would fling her on the ground, and hurt her. He adds: "I took her to our imams and they could not do anything. They themselves have told me that the only one can free her is a monk." He begged me to do something. I promise him that I would pray for them, but I saw that he was disappointed by my answer. When I told the story to my brothers, they all criticized me, because they believed I should have preformed an exorcism, according to the established liturgical rite. And I discovered that many monks and religious are approached by Muslims and asked to cast out demons from a family member and that this practice is very common. Usually, Muslims go to Coptic Orthodox monks or priests and often these exorcisms take place in public. I once witnessed one of these in front of the station square in Cairo (Bāb al-Hadīd), today called Mīdān Ramsis, with candles and holy water. A man lying on the ground, rigid, who swore and was a cripple, at a certain point, became calm. A few years ago, in September 1994, a Canadian priest of the charismatic movement, famous for miracles, came to Lebanon. He was Father Emilien Tardif (1928-1999) of the Missionaries of the Sacred Heart. Tens of thousands of people, many Muslims, followed him asking for his help. His cause for beatification is proceeding. This phenomenon is a fact that I can not explain. But I think that God gives a supernatural gift to some, to be put at the service of all. These gifts are distributed only in a Christian environment, but they are certified, verified by non-Christians. Miracles are made for the benefit of anyone who has faith, the faith that leads God to grant the miracle. In the human being there is a need that is not satisfied in Islam, but which is alive in Christianity. There is a need for spirituality, mysticism and beauty that is offered with greater ease in the Christian world than in Islam. The most symbolic example of this was the decision of the Lebanese parliament to set up a national holiday for all three years ago, choosing the feast of the Annunciation of Mary. It was a deliberate decision by Christians and Muslims. The Koran twice refers to the account of the annunciation (in Chapters 3 and 19), almost in the same terms of the Gospel, and with a much more elegant and solemn style. In these texts the Virgin Mary is attributed is described as being strongly submissive to God and amazed at what happens to her, so much so that God Himself comforts her. These experiences lead to great collaboration and a spiritual harmony with many Muslims. If it is not taken over by Islamic radicalism - which mixes religion and power, religion and state, religion and politics - the Muslim, just like any other believer, nourishes as openness to the supernatural, the spiritual, in his heart. But this aspect is not freely expressed in Islam: the spiritual is planned, the five daily prayers are predefined and must be done with pre-set words, so much so that if make a mistake while reciting them, you have to start all over again. Official Islam lacks spontaneity. For this reason, when a Muslim looks for something more intimate, they look towards Christianity. Devotion creates feelings of friendship and not antagonism. In the West it is often said that religions, especially the monotheistic religions, are a source of wars and divisions. This thesis is false from the historical point of view and from the point of view of content. Of course, wars have been waged in the name of religion. But man has also launched wars in the name of many other ideologies, religion itself does not wage wars. We only have to think of nationalism, the divisions and the world wars fought in Europe, we are forced to admit that nationalism has been the cause of a far worse violence than any religion, and that the atheistic ideologies of the twentieth century, have produced more deaths than religions. Even the religious wars fought in Europe were based on political phenomena that exploited religion ("cuius regio, eius religio "). It was the common view of the time, not the vision suggested by the Gospel. This connection between politics and religion is still very strong in Islam and Judaism as well. Identifying one State with a religion and an ethnic group, generating Zionism, has created a violent movement that was fueled by religion, and that creates problems for many Jews who to not back Israel's politics. On the Islamic side, the Palestinian cause has been identified with Islam and has created the same difficulty, and it is perhaps for this reason that the peace process and a possible reconciliation have stalled. To date, it seems to me that Christianity as a religion distinctly separates faith and politics, though not always perfectly ... like everything that is human. Benedict XVI also writes about this in his Apostolic Exhortation for the Middle East: "A healthy secularity, on the other hand, frees religion from the encumbrance of politics, and allows politics to be enriched by the contribution of religion, while maintaining the necessary distance, clear distinction and indispensable collaboration between the two spheres" (Ecclesia in Medio Oriente, No. 29). In fact, with the Muslims, as soon as you mention Mary, there is a notable change in attitude: there is an atmosphere of piety, of silence, of brotherhood, as if after chatting about many things, you were entering a place of worship, and there is silence. Some might see this as a kind of syncretism. But in fact, devotion is a phenomenon that is open to all. Even in the West, Marian shrines do not only attract Christians, but also other believers, or people who have left the Church, even non-believers. Even though the liturgies are clearly Christian. And if I, as I pray to Our Lady, see a Muslim praying next to me, what's the problem? On the contrary: it is a great comfort because devotion is a far stronger foundation for a relationship and friendship than ideological, political or cultural bonds. Those who think the of Christian faith in an exclusive way, as do some Catholic traditionalists, have yet to fully understand Christianity.